Groove leverages a viral giveaway campaign with HubSpot to boost traffic, new customers, and social media growth with one of our clients. In the eCommerce world today, third party platforms that tout “quick, cheap and measurable ROI” for their services are a dime a dozen. Recently, however, the marketing team at Groove tested a new third party giveaway platform with one of our clients and have seen remarkable results, all in a span of a few weeks. So, I sat down with the team and interviewed them about the contest and what they've seen so far. Enjoy! Why choose to market with a giveaway contest? 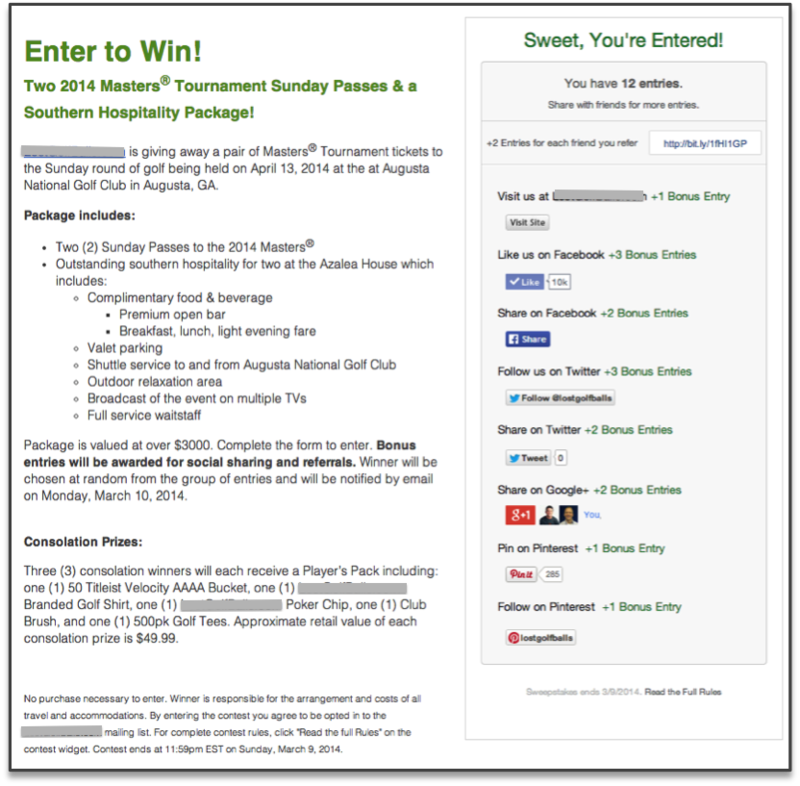 Our client had the idea to purchase two tickets to the Sunday round of the Masters Tournament. Because their overall goals were to increase site traffic and gain new customers and followers across their social channels, we felt that a sweepstakes campaign would be perfect. Given the costs associated with such a prize purchase (ticket package for Masters Tournament valued at over $3,000), we needed a sweepstakes platform that could offer powerful reach capabilities, real-time analytics tracking, custom styling and form design, custom options for embedding, yet require a minimal amount of development support and upkeep. Furthermore, we needed a platform that would seamlessly integrate with our client’s HubSpot inbound marketing platform. How did ViralSweep enter the picture? tons of options for rewarding contestants; i.e. visiting our client's website from the contest page, following our client across social channels, sharing the contest with friends, etc. Why was integrating with HubSpot so important? Our client uses HubSpot for inbound marketing as a complement to their shopping cart. We won't go into details about why we at Groove love this platform so much (we could certainly talk for days about this), or all of the functionality that HubSpot offers, but for the sake of this interview, we'll say that it was paramount for us to be able to robustly track the leads submitted through the contest and then develop automated marketing workflows based on these leads. For example, we're able to set up all new contact leads (individuals submitting to the contest that weren't already in our client’s customer database) into an automated marketing workflow that includes a series of welcome emails over the next few months. Moving forward, we can track all revenue generated from these new customers. The possibilities, in terms of developed workflows, are endless, and the number of tracking capabilities using HubSpot just make capturing ROI an extremely easy process for us. Did ViralSweep already integrate with HubSpot before we used it? No, actually, this was an integration that ViralSweep had not yet attempted. That said, they did already have integrations with platforms like MailChimp, Shopify, and WordPress, so we thought that they might be open to it. Coupled with this, our team of developers here are just extremely versed with HubSpot's API, so we felt very comfortable making the request. How did the team set up the campaign? For maximum reach, we decided to create a dedicated, responsive landing page for the contest through HubSpot and direct people there through various marketing channels (i.e., a banner on our client’s homepage, all social media channels, segmented emails, paid advertising, etc.). In terms of actual contest points, we wanted to reward people for visiting our client’s website, following the brand across the social channels of their choice, and sharing the contest with friends. With this integration, we also had the opportunity to leverage HubSpot’s recently released HubSpot Campaign Tool. This allowed us to see the aggregated results from all marketing channels used which is just another great way for us to truly pinpoint long-term ROI. What results have you seen so far? As far as ViralSweep and HubSpot working in tandem, our results thus far with just one client have spoken loudly. Loudly enough, that we are now looking to implement viral contest campaigns with several other Groove clients. “Given what we saw just after a few weeks, particularly with new contacts acquired and revenue generated, the team at Groove couldn’t be happier with the campaign results”, says John Middlebrook. "While the viral contest alone was a powerful tool, the key takeaway here and what will undoubtedly cement long-term ROI is the importance of putting together a well-balanced and cohesive marketing strategy before, during and after the contest." Not quite reaching your goals as far as increasing traffic to your website, adding new customers to your database and/or growing your social media following? Need a partner who can help you build scalable, ROI-driven marketing campaigns? Contact Groove today and let our team of experts help! Subscribe for industry insights and resources.